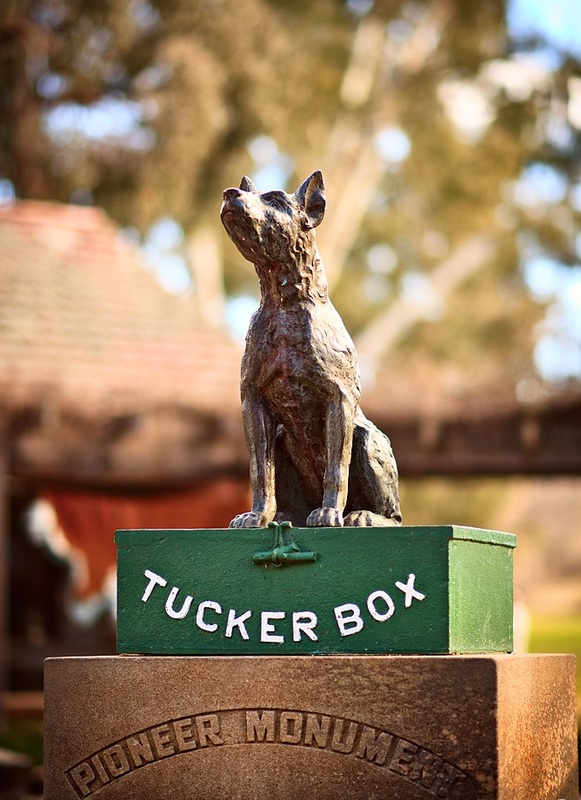 Like much of Australia's early folklore, the origins of the Dog on the Tuckerbox are clouded in mystery, uncertainty and controversy. Yet, as with 'Waltzing Matilda', its origins lie firmly in the Australian bush and the early pioneers - who in this case forged west and south from the colonial headquarters in Sydney, following the explorers searching for the source of the Murrumbidgee River. Numbers of them took up holdings in the Gundagai district in the period 1830-50. They were hard and hazardous times with supplies and stores having to be transported along makeshift tracks over rough terrain by bullock teams. To pass the time while often being bogged, or for the river level to fall at crossings such as Muttama Creek near Gundagai, 'bullockies' would recite doggerel and rhymes picked up on their travels - and, sometimes, even write a few lines. Often on such occasions the bullocky's dog would sit guarding its master's tuckerbox and possessions while he was away seeking help. So was the legend of 'The Dog on the Tuckerbox' born in the 1850s. Whoever the author (using the pen name 'Bowyang Yorke'), the verse was amended some time later and promoted as a poem by Jack Moses. Its popularity quickly spread, capturing the imagination of Australians both in the bush and throughout the colony. 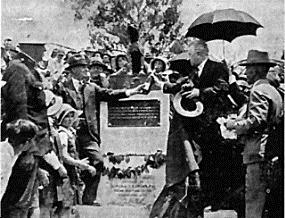 Though the legend was also immortalised by Jack O'Hagan in 1937 in his popular song that put Gundagai on the world map, controversy continued over the exact location of the monument - 5 or 9 miles from the town - and later, on whether to move the famous monument in, or closer to, the town. From The Dog On The Tuckerbox - Its Story by Lyn Scarff.